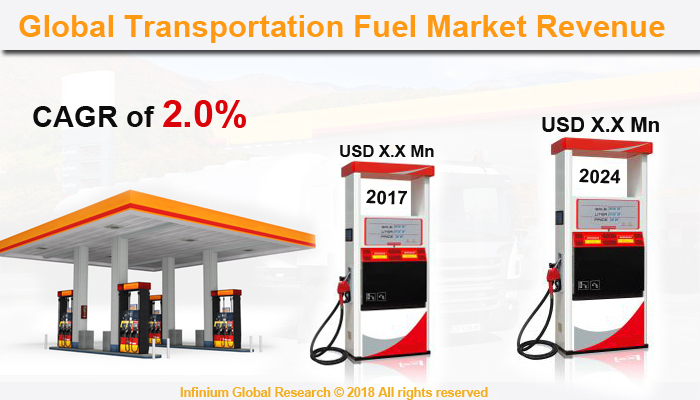 A recent report published by Infinium Global Research on transportation fuel market provides in-depth analysis of segments and sub-segments in global as well as regional transportation fuel market. The study also highlights the impact of drivers, restraints and macro indicators on the global and regional transportation fuel market over the short term as well as long term. The report is a comprehensive presentation of trends, forecast and dollar values of global transportation fuel market. According to the report the global transportation fuel market is projected to grow at a CAGR of 2% over the forecast period of 2018-2024. Transportation fuel is the energy source derived from synthetic fuels, petroleum, and biomass that provides the power for various means of transport. The transportation accounts for the major consumption of energy in terms of fuel. The majority of transportation fuels are derived from petroleum that includes Gasoline/Petrol, Diesel, LPG (Liquefied Petroleum Gas), Marine fuel and Jet fuel. Biofuels and the Synthetic fuels are also used as a transportation fuel in that the ethanol and biodiesel are the biofuels and the fuel made from the different feedstock, converting biomass to liquid, coal to liquid, or gas to liquid are used as transportation fuel. The factors such as increased disposable income, growing sales of passenger cars, and rapidly growing industrialization drive the growth of the transportation fuel market worldwide. The growing infrastructure development and industrialization lead to the high demand for transportation fuel for commercial vehicles. The rising demand for low emissions transportation fuels such as bioethanol, Biodiesel, natural gas, and electricity is anticipated to boost the growth of transportation fuel. However, 80% of transportation fuels are made up of petroleum that emits harmful chemicals when it burns. The transportation fuel emission is one of the major factors for air pollution. Environment-related issues of burning transportation fuel are hampering the growth of the transportation fuel market. Moreover, the adoption of bio-based, clean and eco-friendly fuels are used to provide the power to various means of transport that is expected to create several opportunities for the transportation fuel market in the upcoming years. Geographically, the Asia Pacific region is dominating as well as the fastest growing region in the transportation fuel market. The increasing population, consumer’s expenditure in the automotive sectors, the demand for fuel for commercial vehicles are some of the major factors driving the growth of transportation fuel in the Asia Pacific region. The report on global transportation fuel market covers segments such as types. On the basis of types, the global transportation fuel market is categorized into gasoline, jet fuel, fuel oil, CNG, diesel, and others. The report provides profiles of the companies in the global transportation fuel market such as Chevron Corporation, Essar Oil Ltd., ExxonMobil Corporation, BP p.l.c., PetroChina Company Limited, Royal Dutch Shell Plc, Sinopec Limited, Saudi Arabian Oil Co., Total S.A. and Phillips 66. The report provides deep insights on demand forecasts, market trends, and micro and macro indicators. In addition, this report provides insights into the factors that are driving and restraining the global transportation fuel market. Moreover, IGR-Growth Matrix analysis given in the report brings insight into the investment areas that existing or new market players can consider. The report provides insights into the market using analytical tools such as Porter's five forces analysis and DRO analysis of the transportation fuel market. Moreover, the study highlights current market trends and provides forecast from 2018-2024. We also have highlighted future trends in the transportation fuel market that will impact the demand during the forecast period. Moreover, the competitive analysis given in each regional market brings insight into the market share of the leading players. This report will help manufacturers, suppliers, and distributors of the transportation fuel market to understand the present and future trends in this market and formulate their strategies accordingly.